The Island Highland Gathering – from small beginnings! The Island Highland Gathering was the brain child of local doctor and talented musician, Dr Kieron Cooney, also known as the ‘Piping Hot Doc’. We started with one band on a wet afternoon at Robin Hill in 2011 to raise money for local charities. Despite the rain we had a fabulous day in a wonderful location and people seemed to enjoy it. We began to introduce more bands and also involved lots of local bands and dancers. Dr Cooney’s own band Wight Hot Pipes have played some fabulous sets at the gathering from the very start and still close the show today. The now internationally acclaimed band who play a unique style of Celtic to dance and rock music, they have played at the Isle of Wight Festival across Europe and even BB Kings, New York. We are lucky to have them supporting the Island Highland Gathering, raising money for Island charity Challenge & Adventure in the past Northwood House. The 2019 Gathering is being held at a new venue, Brading Roman Villa. The Villa is situated overlooking Sandown Bay on the Isle of Wight, Brading Roman Villa is one of the finest Roman sites in the UK. Our award-winning Visitor Centre and Museum offer unique insights into Roman life in Britain from beautifully preserved mosaic floors to an extensive collection of Roman archaeology. It’s a great day out rain or shine. Also enjoy their award winning Forum Café which serves local food and drink and is open to all-year-round, whether you are visiting the museum or not. The event has grown now and in 2018 we have 5 pipe bands from across the Country, the Island Medina Marching Band and the 42nd Black Watch of foot, re-enactment group, with cannon. We have Scottish and Irish dancers as well as a pipe and drum competition. The event has been opened by the Lord Lieutenant. Maj General Martin White for many years. 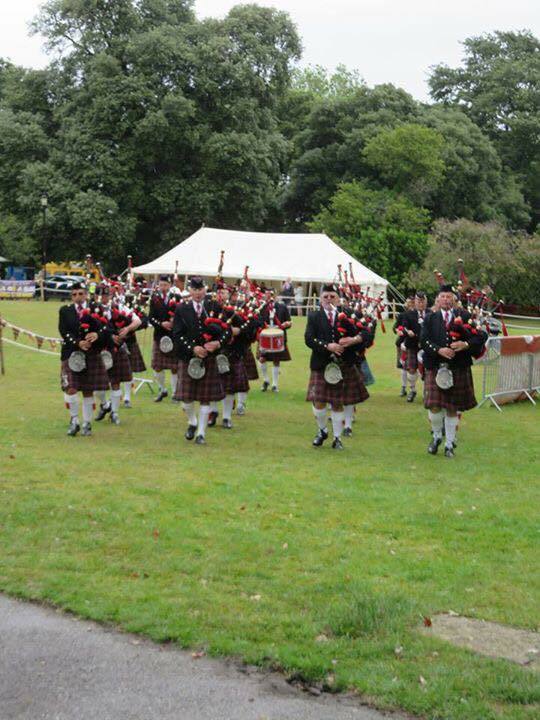 In 2019 we have 5 mainland Pipe and Drum Bands also the Islands own Medina Marching Band. We have Island Scottish Dancers including Shamrock and Thistle, IOW Scottish Dancers and Lynnette Baileys Academy of Irish Dance. From the mainland we are lucky the have The White Rose Highland Dancers. There will be Scottish food, whisky tasting, BBQ, Bar, Tea and Cakes and lots of Island craft stall, and a display of Classic Cars. One of the highlights of the day has been the Highland games, this involves tossing a few cabers and hurling some Haggis as well as a few other exciting challenges. The Island Highland Gathering is organised by a small committee entirely to raise money for charity and to bring something different to the Island.